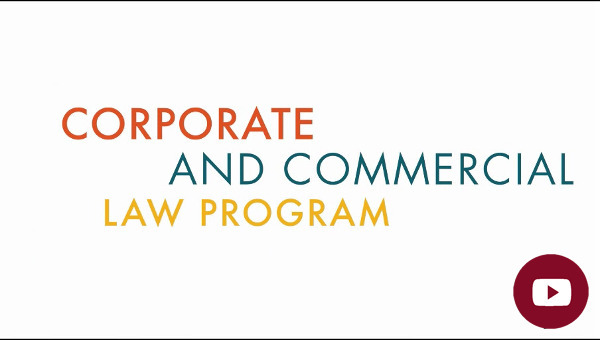 The Corporate & Commercial Law program is designed to prepare Denver Law students with knowledge, insight, perspective and skills required to practice effectively in the areas of corporate law, commercial law and bankruptcy, and business litigation. A rigorous second-year curriculum and experiential and critical-thinking courses in the third year (fourth year for evening students) provide our graduates with a running start as they begin their careers practicing business law. “It’s not enough to have taken the full panoply of courses in subjects that provide a well-rounded legal education. The corporate-commercial law curriculum is designed to train lawyers who aspire to be respected transactional lawyers in the substantive law that they will use every day and the practical application of those principles through problems, writing, and experiential exercises to relate the law to the real world. That training will be recognized by law firms as extremely useful for new associates to begin projects for businesses with issues they understand and strategies with which they are already familiar”. The business law faculty at Sturm College of Law have many decades experience teaching, publishing, and practicing in corporate and commercial law. In Denver Law’s clinical program, business law students represent clients in the Community Economic Development Clinic. The legal externship program permits students to gain experience by working in diverse legal settings including law firms, courts, and administrative agencies. Students participating in the Corporate & Commercial Law program enjoy meaningful opportunities to interact with faculty, alumni, and local practitioners. The Business Law Society and the Corporate Governance Society are student organizations aligned with the program. The Race to the Bottom is a blog with student and faculty contributors.